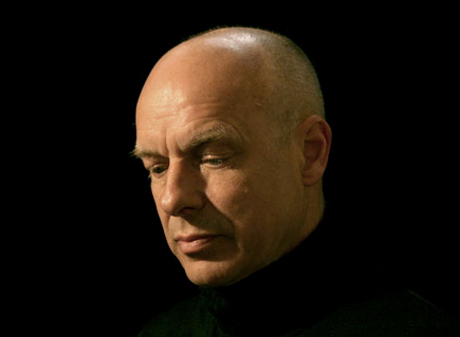 Earlier this month, we reported that legendary producer and musician Brian Eno was rumoured to be releasing a new album on Warp Records. The album, tentatively slated for a fall release, was thought to be a solo effort. Now, we're happy to confirm that the album will indeed be coming out on Warp, but it will be a collaborative effort between Eno, guitarist Leo Abrahams and electronic composer/producer Jon Hopkins. The news comes via Abrahams's blog. In a post labelled "interpersonal soul-searching," Abrahams writes, "Lastly, there's an album out soon by Brian Eno, with myself and Jon Hopkins. It will be on Warp. It contains the fruits of several years of jams between the three of us. I've not heard anything quite like it - it sounds 'live' and 'alien' at the same time. Some things have been permitted to survive, which only Brian would have had the courage to let go, and it's so much the better for it." Abrahams is a British guitarist and composer who has released several solo albums and collaborated with everyone from Paul Simon to Nick Cave. According to a biography on Just Music, he was discovered by Eno in a music shop, who described him as "an unassuming guy just quietly playing the most beautiful guitar in the corner." Hopkins is a pianist and electronic composer who has released three solo albums on Domino, as well as collaborations with Herbie Hancock, Coldplay and many others. Little else is known about Eno's Warp debut, but the album is thought to be coming out in October or November. Audio of all three artists collaborating at the Sydney Opera House can be heard below. A big thanks to Enoweb for returning the favour and giving us the heads-up. UPDATE: Warp has confirmed that Eno will release an album on the label later this year. You can get more info here.